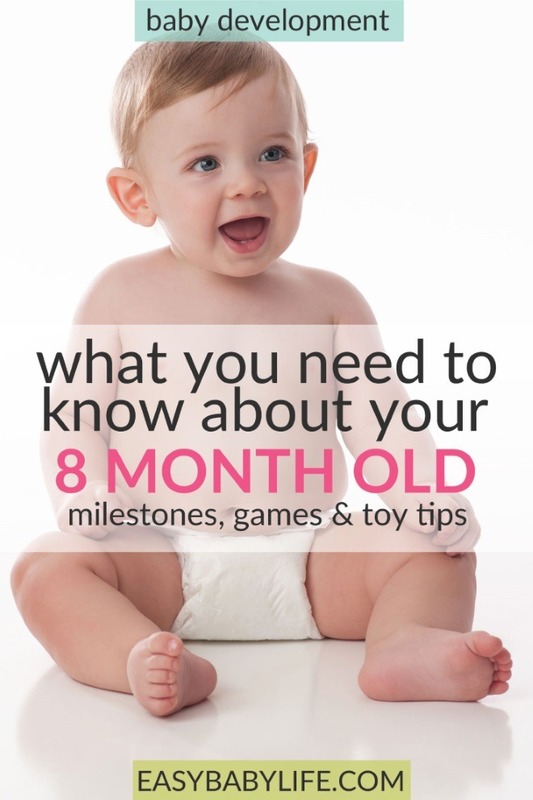 The Cute 8-Month-Old Baby - Development Milestones, Fun Games to Play and Toy Tips! Home > Baby Development Month By Month > The Cute 8-Month-Old Baby – Development Milestones, Fun Games to Play and Toy Tips! The Cute 8-Month-Old Baby – Development Milestones, Fun Games to Play and Toy Tips! Your 8-month-old baby can be really fun to be with, practicing his or her new skills with great joy. Or if he/she is still struggling to understand how to stand up or move around, your baby might be quite frustrated and irritated. Now, or soon enough you cannot be sure to find your child where you put him or her down! It is definitely time to start thinking about baby-proofing your home. This is the starting point of some 18 months or so when you will have to guard your baby very carefully. Time to start exercising! The day our daughter was 8-month-old, she got her first tooth and she managed to sit up by herself from being placed on the floor on her tummy. I can assure you that she preferred the sitting up. Teething was never one of her favorites. If not before, you are likely to notice that your 8 months old baby is developing some degree of separation anxiety. Often, mom is the big favorite and sometimes no one else will do, especially when the baby is tired or sad. Some have also found out that they can move around while sitting, by using their hands and feet. Some babies creep, crawl or shuffle. Also, many 8-month-old babies are learning how to pull themselves up to standing position and remain there for a while by holding on to something. Watch your baby carefully; he is not likely to have developed any balance standing up yet! Your baby may be practicing his pincer grasp, using the thumb and one or two fingers to pick up small things. An 8-month-old baby has a vision that is almost as good as an adult’s. However, even if depth vision is well developed, the depth understanding is not. Your baby may see that the couch is ending, but that won’t prevent him from crawling right out into the air. At this age, babies are good at interacting with more than one person at the same time. It is possible to play peek-a-boo, or throwing a ball together. Investigating things is also a favorite. Give your baby new things to analyze, for example, toys or kitchen tools. He is likely to bang them, bite them, throw them away and stick his little fingers in wherever possible. Your 8-month-old is also able to imitate you. Make simple faces, put your hands in the air or shake your head. Your baby can follow you, which is a great way of interacting. And fun for any spectators. This can also be a great game to play together with older siblings. Let your baby practice his/her pincer grasp by giving them boiled rice, pieces of banana, peas or corn to pick up. Find more safe finger foods here. Musical toys, like for example this one that make sounds when banged together are fun, like a small drum, cymbals or castanets. Just make sure that they are not too loud. 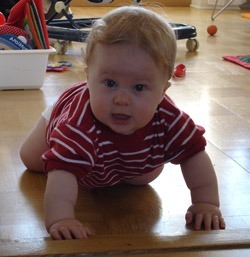 Balls, cars or any other toys that can roll or be moved is fun once your baby has learned how to crawl. A somewhat terrible toy (for adults) that our baby really liked at this age was Fisher-Price Laugh & Learn Smart Stages Sis. If you press different parts of its face and body, the toy starts singing or rhyming in a (too) cheerful voice. It also changes what happens over time. At 2 years old, our baby (now a gorgeous toddler) still used toy as a dance partner. Value for money, even if the voice drives me crazy sometimes. 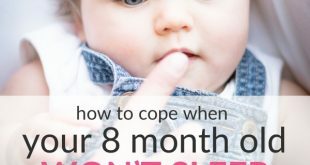 Fussy 8-Month-Old Baby Cries When Put Down – What Do I Do Wrong? 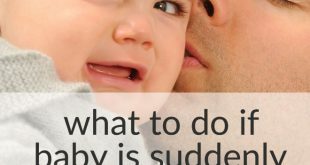 8-Month-Old Baby Throwing Tantrums If Not Held – What Do I Do? 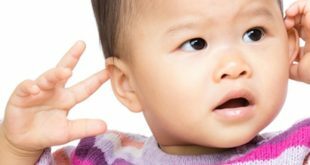 Toddler Hits The Side of His Head With His Hand – When to Worry & What to DO? 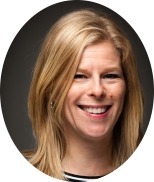 Hot topics – Join the talk!